The HVAC system is one of the most important parts of a home. However, it is something that many homeowners don’t pay a lot of attention to – until they have an issue. If it provides heat and cool air when needed, most people barely think about it. As a result, this can be difficult for HVAC companies to grow their businesses, especially the ones focused on maintenance. This is why marketing is so important. With the right HVAC marketing in place, a business can show their customers why their services are so important. What Does a Strong HVAC Marketing Plan Involve? A lot of people think branding is just a logo or slogan, but it is much more involved than that. Branding includes everything a business portrays to the world. It has to be consistent across all channels. Plus, in order to find the ideal customers, it needs to align with a company’s core values. The internet has never been more important to a business. When homeowners look for any type of service, they open a search engine to find what they need. This is why HVAC companies need to have a strong online presence. They need a well-designed and easy-to-use website. In addition, a successful online marketing strategy has to put a focus on mobile. Search engines do not recognize businesses whose websites are not mobile-responsive. When people type a keyword into a search engine, they want to find a business that relates directly to their needs. Searchers respond to the top-ranked companies returned as a result of their search criteria. Moreover, there are complex requirements and methods to help businesses rank higher than their competitors in these searches. Search Engine Optimization – SEO – is now a crucial element of a marketing strategy. But this doesn’t just involve sticking some keywords into a website. A comprehensive plan will drive the most traffic. And, for local companies, this needs to include an emphasis on local SEO. Another vital part of HVAC marketing is social media. With so many users on these sites every day, they provide businesses with an excellent opportunity to find potential customers. Additionally, social media allows companies to provide helpful information and create engagement without being overly promotional. What Does Good HVAC Marketing Look Like? To see an example of solid marketing for an HVAC company, you can look at Aspire Heating & Cooling. Immediately, you will notice that this Triad company has a user-friendly website that clearly exhibits the services they offer. The site is also mobile-responsive, so it will always perform well no matter the device someone uses to view it. ConversionMOXY optimizes every page for SEO purposes. This enhances the company’s search engine marketing. Plus, they post regularly to several social media networks, including Twitter and Facebook. Using local directories is another important component to allow customers to locate a particular type of business. 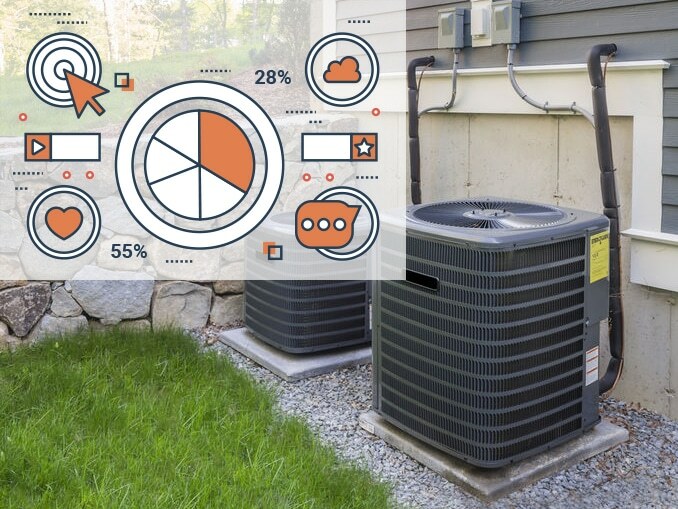 At conversionMOXY, we know what it takes to create an effective, integrated HVAC marketing plan. We helped Aspire improve their web presence, and we can do the same for you. Our services include PPC, display advertising, retargeting ads, and more. With a creative, experienced team, we can develop a wide-ranging marketing plan to expand your business. From creating websites to branding and all of the above facets of a marketing plan, we have the experts to put it all together for you. Today, find out what we can do for your HVAC company. Contact us at 336-701-1790, or just fill out this form for a free quote.